Office Manager: Usually an Office Manager role is a natural progression from being a Personal Assistant or Team Secretary. The role of the Office Manager is to ensure the smooth running of the office which could include some or all of the following tasks, operations and procedures, budgets, payroll, maintaining filling systems, ordering stationery and recording and maintaining holidays and sickness. A highly organised and proactive professional Office Manager with 10 years of experience. 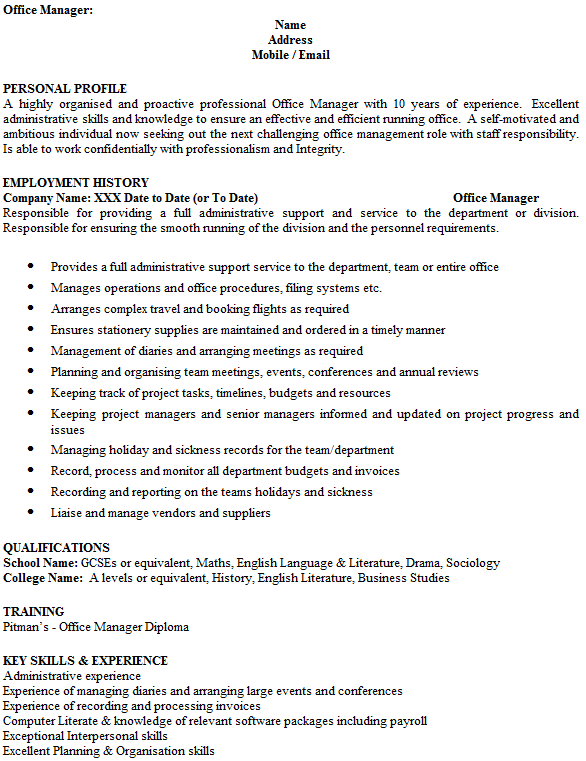 Excellent administrative skills and knowledge to ensure an effective and efficient running office. A self-motivated and ambitious individual now seeking out the next challenging office management role with staff responsibility. Is able to work confidentially with professionalism and Integrity. Responsible for providing a full administrative support and service to the department or division. Responsible for ensuring the smooth running of the division and the personnel requirements. Manages operations and office procedures, filing systems etc.